When the temple ceremony in Besakih, almost all the shops are located around the path to the temple, selling fruit typical Karangasem regency, Bali, the fruit Salak Bali. Salak Bali known to have a large size with a sweet and savory flavor. Which can only grow well in the area of ​​Karangasem, Bali. As we walked towards the temple Besakih, there are many fruit sellers salakbali. They offer wares to passing pedestrians. When I finished the worship at Besakih, and walked toward the parking lot, I thought to buy presents for my family at home. At that time I thought a gift that fits is the fruit Salak Bali. Because Salak Bali is the typical food of Karangasem. I was with my friend rushed to the nearest one salakbali sellers. We talked to the seller with a bid to get lowest price. After completion of bidding, I decided to buy 2 kg Salak Bali. When choosing Salak Bali, I chose the fruit with great size and looks mature. I believe that the pieces that I chose is the best fruit. All the choice I leave to the seller to be wrapped and weighed weight. When I got home, I opened the package that I bought Salak Bali. I was genuinely surprised, after the package is opened, the fruit turns Salak Bali that I bought did not fit with what I choose at that time. Small size is not good and it's also sour. I tell that to my friend. Apparently they are also experiencing the same thing. Once we talked, we interpret that the fruits that we have chosen, Salak Bali replaced with poor quality when traders doing the weighing. We totally cheated by the traders Salak Bali. 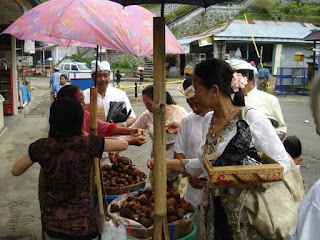 So my advice, be careful when buying fruit Salak Bali, Besakih temple, Bali.